Discover a Customer Contact tool for Messaging Apps and communicate with your customers via one dashboard. Customer Contact is a one-to-one dashboard that provides customers the ability to communicate with your business through WhatsApp, Facebook Messenger, Viber, Telegram, Twitter and SMS. In today’s digital-first world, where consumers expect an instant service and immediate results, it is vital that brands take the same approach when it comes to delivering seamless customer service over digital channels. With so many social chat tools coming online each year, how do you ensure an efficient and personalised experience for your customers? We give you one inbox to manage it all. Give your customers fast support and live chat customer service via multiple channels with CM Customer Contact. With customer contact you can unify all customer messages across multiple messaging channels and give your customers a better support experience. Choose to integrate with other applications, such as CRM systems and analysis tools. Build a customer centric experience on the channels that your customers actually prefer using our Messaging API. Streamline all your customer conversations in one place. Set up quick replies and chat bots. Seamlessly transfer chats to other departments. See average response time and tag conversations by type of query. How much will Customer Contact cost? Unlimited users. Price exclude 15% VAT. How to get started with Customer Contact? 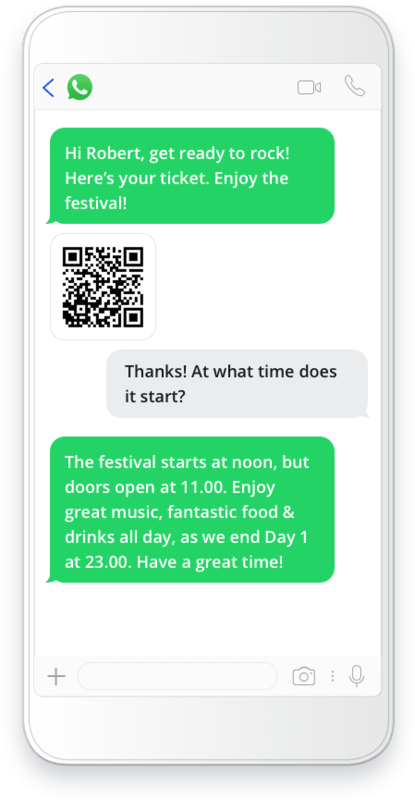 Using our business messaging API, you'll have access to all the messaging channels, WhatsApp included. We'll help you get access to your API key. We deliver your message via the channel your customer prefers best.